The new liquid drink mix gives you refreshing, full-flavored taste you love, without the calories, freeing you from the choice between calories and taste. The liquid drink mix is available in 1.62 fl. oz. multi-serve bottles with 24 servings in each. They are sugar-free and sweetened with a blend of non-nutritive sweeteners and are gluten-free. They are simple to use, just flip open the top and give a quick squeese into water. Use one squeeze or more for each 8 fl. oz. serving of water. You can find the new Crystal Light Liquid Drink Mix nationwide in your favorite grocery stores and retail stores that sell food & beverages. My Thoughts: I have always loved Crystal Light Drink Mixes and have been hooked on the Peach Bellini drink mix for the past year and a half. When given the chance to try a new product by Crystal Light, I jumped at the chance. For my review, I selected the new Strawberry Lemonade drink mix, because during the summertime, it's one of my favorite drinks...and I am craving a little bit of summertime right now! I filled up my glass with 8 fl. oz. of bottled spring water and squeezed in 3 drops of the liquid drink mix. I had heard from others that if you like your water really flavored with this new drink mix, to use 3 drops, so that is what I did. I had a little taste and decided that it wasn't strong enough for me, so I added a 4th and it made it absolutely perfect! I then dropped in my ice cubes and got busy enjoying my new glass of strawberry lemonade. What really excites me about this product is that I don't have to refrigerate it after opening it. I can toss it into my purse, briefcase, luggage, desk drawer, etc. and take them with me while I am out and on-the-go. I love that they are portable, taste great and totally affordable! If you like just a slight taste to your beverages, then I would suggest only doing one or two squeezes, but if you are like me, go for three or four squeezes per glass. It's really nice that we can customize it according to our own individual taste buds. Yay!!! I am going to look for them in the stores as I really want to try out the Mango Passionfruit and Blueberry Raspberry flavors next. Thanks Crystal Light for making another delicious beverage product! You can follow Crystal Light on Facebook and/or follow Crystal Light on Twitter. 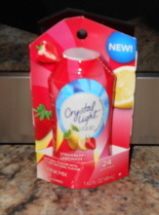 Disclosure: I received a free sample of Crystal Light from the great folks over at Kraft Foods for the purpose of this review.